The band Sickening was born in Firenze, Italy, during December 2003 with the intent of playing a classic death metal of a pure american breed. Within a month from its birth the band settles down with Alessandro Materassi and Andrea Smeraldi on guitars, Claudio Miniati on vocals, Marco Belardi on drums and Lorenzo Parri on bass; the harmony between members and the will to play quickly lead to the creation of songs upon songs, to the point that the first live show is performed in May 2004. More songs and more concerts keep coming during the following months, till - during October of the same year - the band goes in the studio to record the first demo, "Deceptive Truth". The recordings see the end only in March 2005 because of lack of time and for the departure of Lorenzo due to his getting away from the metal environment. Therefore, the bass parts have been recorded by Alessandro, while Dario Agostini will come forth to become a permament member only a month later, completing the line up. In September Marco left Sickening for work problems: drumming duties have been taken over by Beppe. In December of the same year the "Deceptive Truth" demo has been released by Eyes Of The Dead Productions as a split cd-r with Zora, a death metal band from Vibo Valentia. During November 2006 there is yet another change: Marco Taiti takes Beppe's place on the drumset. The first full-length album of the band, "Ignorance Supremacy", recorded and mixed between July and September 2007 by Lorenzo Bellia at "Play Loud!" in Florence, is released in March 2008 by Nice To Eat You Records and officially distributed by Sevared Records in the USA. In April 2009 Andrea left Sickening but the band continues its activity playing live and writing new songs for the second full-length, "Against the Wall of Pretence", recorded in August 2010 at "Studio Emme" in Florence and mixed in November at "16th Cellar Studio" in Rome. The album is released in April 2011 by Amputated Vein Records. In November of the same year Massimo Falciani takes Dario's place on bass. The band plays many gigs across Europe promoting the second album. In January 2013 Edoardo De Nardi is the new bass player. In May 2014 the band completes the songwriting of "The Beyond", a concept album about the so titled movie from the master of horror Lucio Fulci. In the autumn of the same year Sickening enter "MathLab Studio" for the recording of the third album, mixed by Stefano Morabito at "16th Cellar Studio". 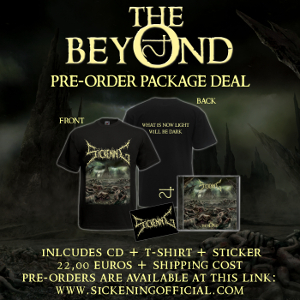 "The Beyond" is released on March 10th 2015 via Amputated Veins Records. In early 2015 Marco Taiti left Sickening and Thomas Passanisi replace him in April 2015.